I’ll admit: I’m a bit of a sucker for any kind of brew that plays to my nerdy interests. Quirky beer names and unusual labels tend to rub me the right way too. 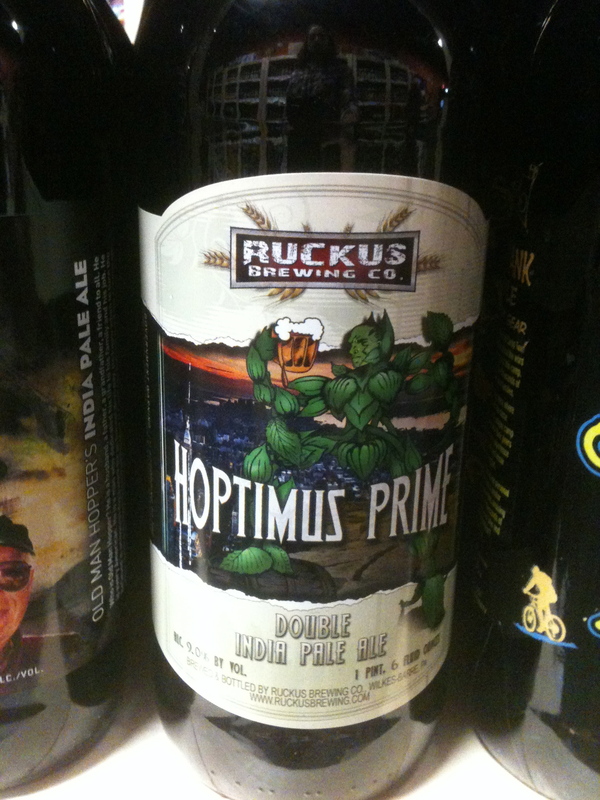 It took two passes through the robust beer isle at the Brattleboro Co-op before I found it, but the moment I set eyes on Ruckus Brewing Co.’s charmingly named “Hoptimus Prime” I knew I had to possess this Transformer-inspired brew. But was it love at first taste? Read on my friend, read on. Though it’s wrapped in a muted label that’s easy to miss amongst the other 22 oz bottles sitting on the shelf, Hoptimus Prime is a real looker when you finally do spot it. Sporting a giant beer-drinking robot dude constructed entirely of hops, you’d half expect to hear the familiar “Ch-ch-ch-ch-ch-ch-ch” sound when you crack open a bottle. This double IPA packs a mean kick at 9% ABV, yet its strength is masked by a force field of sticky sweetness. Appearance – Yields a nice light golden amber pour with a slight haziness and low carbonation. The thin head was light and dissipated quickly, leaving a touch of lacing on the glass. Aroma – A faint orange-heavy citrus aroma mixes with a touch of pine and malt to hint at the complex flavors contained within. It’s gentle on the nose but intrigues the taste buds with an alluring pre-game hop bouquet. Taste – Up-front, you get a welcoming blast of citrusy hop tang that dissipates quickly to let the strong sweetness of the caramel malt do its thing. For a brew with five different hop varieties, the overall hop flavor is dynamic but not bitter. In fact, the sweetness takes over a little too much, and the aftertaste has bready notes and a stickiness that mingle on the palate. Overall– A great name does not necessarily make a great brew. Hoptimus Prime certainly gets off to a good start, but the sweetness is a tad too heavy. For such a strong IPA, it’s very drinkable, but it lacks balance. Still, the novelty factor of rolling out one of these beasts when nerd-friendly company is over is pretty rad. This entry was posted in Beer Nerdistry and tagged beer, beer nerdistry, double ipa, freelance, geek, hoptimus prime, nathan meunier, nerdy beer, Review, ruckus brewing cp., tasty, transformers by nmeunier. Bookmark the permalink.